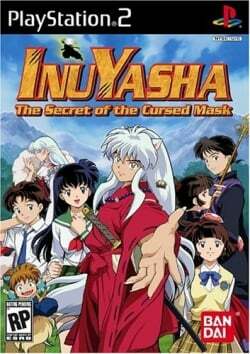 Game description: Explore the spiritual world of Inuyasha and encounter your favorite characters from the animated series in the new role-playing game Inuyasha: The Secret of the Cursed Mask. You'll travel the lands battling monsters and discovering a variety of items. The game features original characters and animated cutscenes created especially for the game. If have what it takes to complete the game, you can unlock secret areas and other bonuses. The game begins when Kururugi enters the family storage shed in modern day Japan to retrieve an item for father. After falling through a mysteriously etched pentagram on the floorboards, the player is transported to Feudal Japan. Unfortunately, the villagers mistake the time traveler as a demon and attack. After several close calls, Kururugi comes face to face with InuYasha, who notices the stranger's clothes "look like Kagome's." After introductions with the rest of the cast, the player begins to search for answers as to why Kururugi has been brought back to the feudal era and how to get home. BIOS: USA v2.0, These specs are overkill anyone with lower that can get stable 60 FPS please edit. • ==Speedhacks/Settings== • INTC Sync Hack: Small if any speedup, no issues. • Idle Loop Fast Forward: Noticeable speedup, no issues. • MTVU: Noticeable speedup in quad(4)core CPUs. Description: Characters have black outlines around parts that move after batter (eyes and mouth). Workaround: Go to Config > Video (GS) > Plugin Settings, and set Texture Filtering to "Bilinear (PS2)". This page was last edited on 1 January 2017, at 21:09.